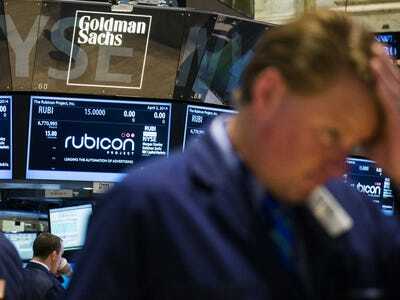 REUTERS/Lucas JacksonDemand for engineering talent is increasing at Wall Street banks, like Goldman Sachs. For decades, Silicon Valley has been the top destination for many talented computer scientists coming out of college. Tech companies like Google, Apple, and Facebook attracted top talent with ease, offering heavy paychecks with massive stock options and no formal dress code at work. But as banks started to rely more on heavy data and financial engineering technology, demand for engineers on Wall Street has shot up. It takes a lot of work for banks like Goldman Sachs to hire these talented engineering recruits, according to the New York Times. For example, Goldman has to explain at college recruiting events that its engineers don’t just work mere back-office jobs, but actually build meaningful software that gets used by traders every day. It also revamped its website to look more young and fresh, and has been using cool words like “cloud computing” and “data mining” in presentations. One of the biggest challenges has been answering questions about its strict dress code. By nature, it’s almost impossible for Wall Street banks to allow its employees to come into work wearing flip-flops and a hoodie, like many Silicon Valley tech companies do. But these concerns tend to disappear once the question of pay comes up. “As soon as we start talking to the candidates about what our starting packages look like, the lifestyle questions about flip-flops and beanbags really start to go away,” R. Martin Chavez, Goldman Sachs’ Chief Information Officer told the New York Times. The push does seem to be working. The number of bankers with high-level programming background at Goldman Sachs has jumped 43% to 1,223 employees since 2009, the Times reports. Goldman Sachs’ largest division is, in fact, its technology division with 8,000 employees, or roughly 25% of its total workforce, it says.